File: A mother bald eagle tends a check on California's Santa Cruz Island. 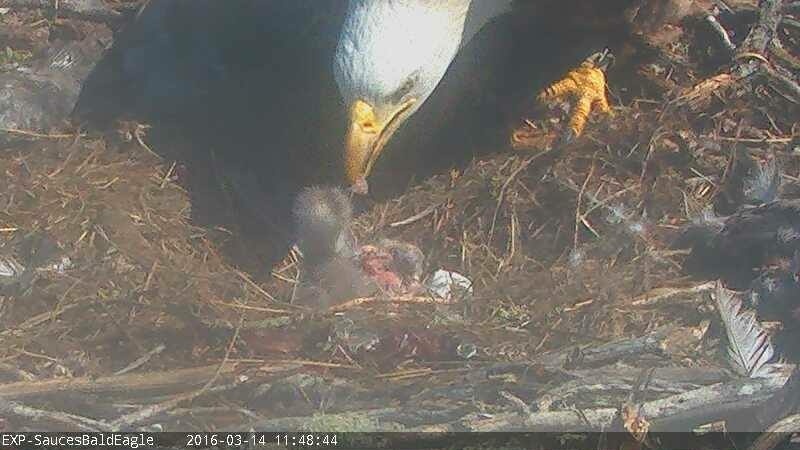 The hatching of two bald eagle chicks in a nest on one of the Channel Islands off Southern California gave webcam viewers a thrill this week. Channel Islands National Park says the two chicks hatched 14 hours apart on Santa Cruz Island, and a third egg chick was expected Friday. The hatchings are a sign of progress in restoration of the species to the island chain where the birds disappeared in the 1960s due to the effects of DDT and other human activities. There are now 50 to 60 bald on the Channel Islands and 13 active nests, where at least 22 eggs have been laid this breeding season. There are five webcams that follow the activities of eagles.